Frederick Bennett : Pitcairn Island, 1834. 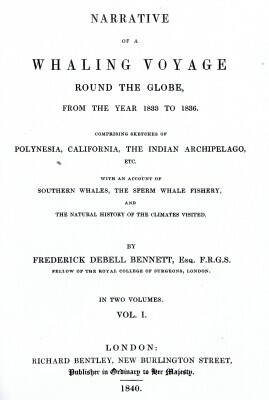 Narrative of a Whaling Voyage Round the Globe, from the year 1833 to 1836. Richard Bentley, New Burlington Street, London, 1840, page 35. A brief description of juvenile surfboard riding on Pitcairn Island in 1834. The only aboriginal games we noticed among them was one resembling quoits; a second played with black and white stones on a checquer-board, in a manner approaching to chess or draughts; and the pahe, or darting rods along the smooth ground to, or beyond, a determined mark. Horsemanship is now a favourite exercise with both sexes- the females riding a la fourchette. Extracts from Bennett's book, including the Pitcairn Island surfing report, were published in the Sydney Morning Herald, Saturday 28 November 1840, page 3. 1852 Matthew Moresby: Surfriding on Pitcairn Island. Their children are stout and shrewd little urchins, familiar and confident, but at the same time well behaved. They are early inured to aquatic exercises; and it amused us not a little to see small creatures, two or three years old, sprawling in the surf which broke upon the beach; their mothers sitting upon the rocks, watching their anticks, and coolly telling them to "come out, or they would be drowned;" whilst the older children, amusing themselves with their surf-boards, would dive out beneath the lofty breakers, and, availing themselves of a succeeding series, approach the coast, borne on the crest of a wave, with a velocity which threatened their instant destruction against the rocks; but, skilfully evading any contact with the shore, they again dived forth to meet and mount another of their foaming steeds. Round the Globe, from the year 1833 to 1836. New Burlington Street, London, 1840. Geoff Cater (2010-2016) : Fredderick Bennett : Pitcairn Island, 1834.